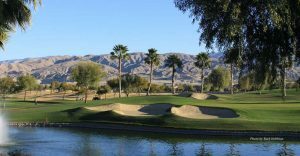 If you love to golf, enjoy socializing and getting to know your neighbors, dream of resort-style living, and are 55 years or better, then Sun City Shadow Hills Homes for Sale in Indio are the perfect choice for you. This premier, Del Webb active adult community is located two miles east of Sun City Palm Desert and offers some of the most desirable low-maintenance homes for sale in the Coachella Valley. Residents enjoy a vast array of outstanding amenities including an 18-hole golf course, 2 clubhouses/activities centers, indoor walking track, shuffleboard and pickleball courts, bocce ball and tennis courts, heated community pools and spas, state of the art fitness facilities, dozens of clubs, classes, and planned activities, a restaurant and cafe, and so much more! Explore all Sun City Shadow Hills Homes for sale – listings updated daily! Interested buyers will be excited about the wide selection of Sun City Shadow Hills homes for sale Indio CA to choose from. The community is comprised of 3,400 single-family homes built between 2003 – 2016 and includes over 30 single-family floor plans ranging from 1,099 Sq.ft to nearly 3,000 Sq.ft. There are a total of four different collections of floor plans: The Santa Barbara Series, Shadow Series, Living Well Collection, and Santa Rose Series. Buyers can choose from beautiful ranch-style homes offering two bedrooms, two baths, and a two-car garage or larger homes with up to three bedrooms, three-and-a-half bathrooms, and a three-car garage. Some homes also feature space for your golf cart. Buyers are sure to find the perfect home ideally suited to their wants and needs in this premier, Del Webb active-adult community. Sun City Shadow Hills homes for sale Indio CA range in price starting at the mid-$200s to the mid- $700s. The master-planned, active adult community of Sun City Shadow Hills features two clubhouses/amenities centers – the Montecito Clubhouse and the Santa Rosa Clubhouse. The 35,000 Sq.ft. Montecito Clubhouse facility includes a state-of-the-art fitness center, aerobics and dance studio, arts and crafts studio, ballroom, billiards hall, library, card room, meeting rooms, an indoor lap pool, and a bistro. Just outside the clubhouse is an outdoor pool along with tennis, bocce ball, and shuffleboard courts. The 14,000 Sq.ft. Santa Rosa Clubhouse facility includes a state-of-the-art fitness center, indoor walking track, the Santa Rose Cafe, a card room, and meeting rooms. Just outside the facility are pickleball and shuffleboard courts, a basketball court, outdoor patio, and a pool. Avid golfers will enjoy the 18-hole Shadow Hills Golf Course designed by Lee Schmidt and Brian Curley. Players of all skill levels will find an exciting challenge at Sun City Shadow Hills. There’s also a par 3 course for residents who want to work on their short game. Those who decide to purchase one of the beautiful Sun City Shadow Hills Homes for Sale Indio CA and become part of this exciting community will have the opportunity to enjoy a variety of clubs and interest groups, where like-minded individuals can socialize and share similar passions. Residents can choose from arts & crafts, photography, billiards, exercise clubs, games & cards, and golf and sports leagues – just to name a few. The welcoming atmosphere at Sun City Shadow Hills encourages residents to explore new interests and hobbies while making lifelong friends. One thing is for certain when you live in Sun City Shadow Hills — you’ll never run out of fun and interesting things to do, and where every day is like being on vacation! With over 24 years of real estate experience, Elaine Stewart offers a wealth of local market knowledge and expertise. Elaine truly enjoys helping people with the process of buying or selling homes in the Coachella Valley. As a licensed, professional REALTOR®, Elaine is committed to providing her clients with accurate, reliable and trustworthy information and the exemplary, personalized service they deserve.